Use this event if you need to generate a Webhook and send it to a 3rd party application based off of information gathered from a webhook or email. First, click the Add Another Event button. 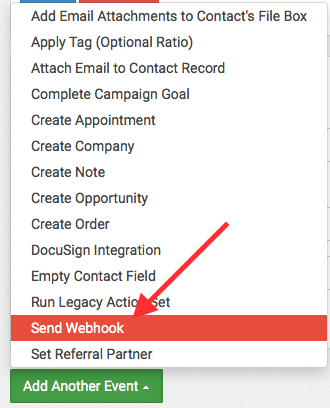 Then click Send Webhook. Now you can input the URL that you will be sending the Webhook to. You can also click the "+" button to add more fields to the Webhook. To add Merge Fields to the Webhook, first give it a Name. In the example below, my name is ExampleNameLabel. Then click the "i" and highlight the Merge Field that represents the Name you just created, and paste it into the Value field next to your Name. Then click Save. Now it is fully configured and you can begin sending Web Hooks to other applications!